UNC Asheville’s Honors Program provides a rich curriculum for motivated students who seek to understand themselves and make a difference in the world. Together, students, staff, and faculty create a community of dedicated and enthusiastic scholars who care for the well-being of all. 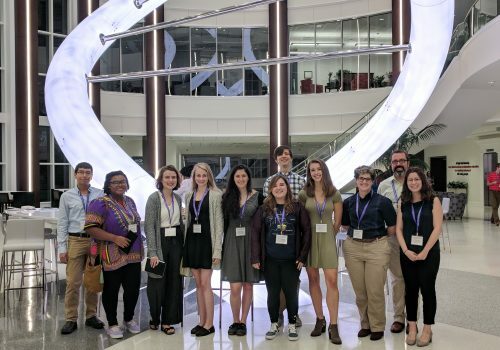 Honors students have opportunities to travel in the United States and abroad, to interact with distinguished campus visitors, to participate in enriching co-curricular and extracurricular activities, and to forge strong relationships with outstanding professors. Engaged in scholarship, campus life, and the greater Asheville community, Honors students value education and strive to create a better society, one in which every life may flourish. If you are a self-motivated learner who understands the value of challenging classes and are willing to give your time and talents to a greater cause, we encourage you to apply to the UNC Asheville Honors Program. Should you have any questions or want to know more about the opportunities we afford and the obligations Honors Program membership entails, please contact Program Director Patrick Bahls at pbahls@unca.edu. Applications to the Honors Program are welcome from all UNC Asheville students, including new students, continuing students, and students who transfer from other institutions. Also, though we appreciate parents’ and other family members’ support for prospective Honors students, we strongly prefer to communicate directly with interested students themselves regarding the Honors Program. We are delighted to announce that the application for Fall 2019 admission to the UNC Asheville Honors Program is now available! All students who have been admitted to the university can complete the Fall 2019 Honors Program Application here. We will review these applications on a rolling basis, with applicants notified within a few weeks regarding their decision. Please note that this application should be completed ONLY by first-time students not yet attending UNC Asheville. Current UNC Asheville students and students transferring to UNC Asheville from other institutions of higher education should consult the How to Apply page to learn how to apply for the program.